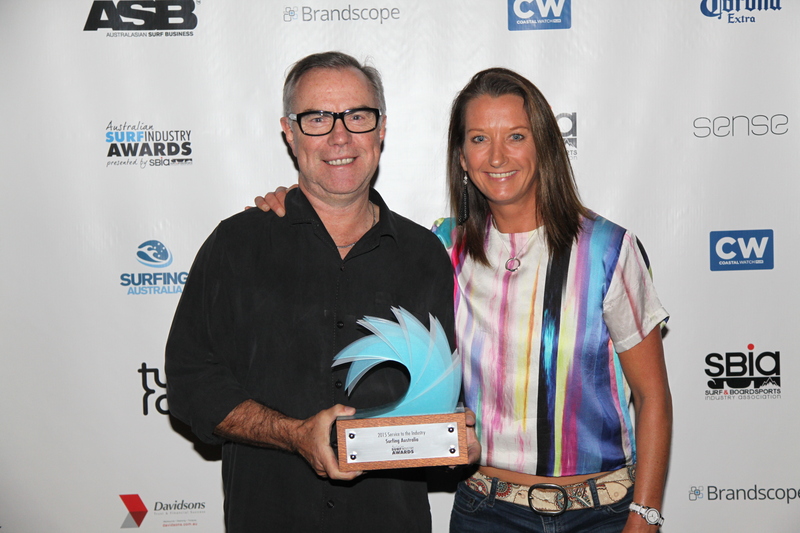 2015 Australian Surf Industry Awards presented by Surf & Boardsports Industry Association Inc.
JUNE 15, 2015: The Australian surf industry celebrated its annual awards in fine style in the Gold Coast on Thursday June 11. Held at Twin Towns resort, the night attracted over 200 retailers and brand representatives from all over Australia, on hand to acknowledge the high achievers of the Australian surf industry. Both retailers and brands were recognised with 34 awards presented throughout the night, across a number of retail, product and marketing categories. Highlights in the retail oriented awards included the Australian Retailer of the Year, won by Saltwater Wine/Stormriders, Aloha Manly winning the Core Boardstore award and Strapper Surf and Blunt Skateboarding Co the shop fit-out of the year. On the brand side, Rip Curl took out product of the year in the boardshort, wetsuit and surf accessories categories, Oakley won sunglass of the year while Billabong were big winners, taking home men’s and women’s brand of the year and also men’s and women’s marketing campaigns of the year. ”Winning the four major awards is a massive statement from our retail partners of the commitment and enthusiasm that Billabong brings to the Australian surf market. We’re very thankful and stoked to be recognised in such a way,” said Billabong men’s marketing manager Scott Hargreaves. The coveted surfboard of the year was won for the second time running by Haydenshapes for its Hypto Krypto Future Flex. Surfing Australia was also recognised for all the work it does at a grass roots level for Australian surfing, winning the Service To Industry award. The Australian Surf Industry Awards are held annually with entries opening January each year. The awards were launched in 2011 to celebrate the Industry’s outstanding Retailers, Products and Brands. With 34 categories ranging from Core Boardstore to Men’s Brand of the Year the Awards also recognise outstanding Service to the Industry. The role of the Surf & Boardsports Industry Association is to drive the vibrancy, growth and business opportunities for the industry. The Surf & Boardsports Industry Association Inc (SBIA) is a non-profit organization, founded by, and run by Surf & Boardsports Retailers and Industry Brands. The association serves as the preeminent voice on a grassroots level with manufacturers, suppliers, and other associations. Want to see who the 2015 Finalists were? Click me!